The refugee camp on the Greek island of Chios, an old aluminium factory, can host up to 800 refugees, but now has more than 2300. There is food, water, and medical care available, but the only living space is in tents or containers, and there are not enough. This means many refugees are exposed to the cold and rain. 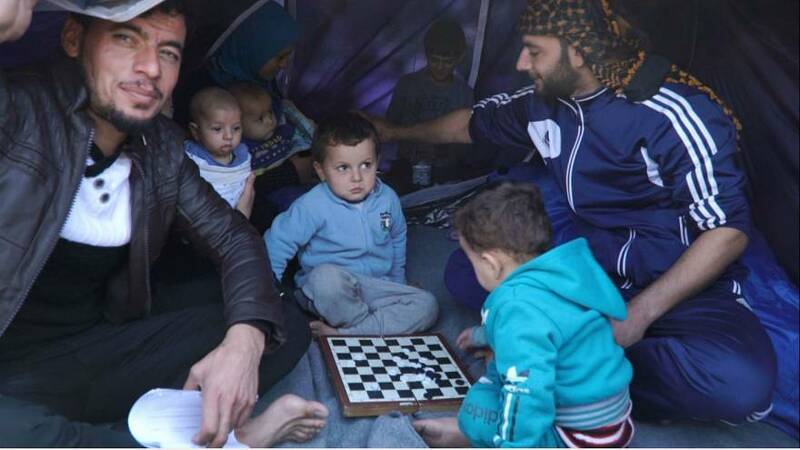 Adbulmajed Hussain from Syria does not even have a tent. The 28-year-old man is a father of two baby boys and his wife is pregnant. He is only asking for a roof over their heads. “It’s cold, it’s winter. We need a container for our kids. We don’t care about ourselves, but i have kids and my wife is pregnant. We can not protect ourselves from rain,” he says. While the food, water and medicine inside the camp is free, some complain that they had to pay for their tents. Kasim from Iraq says that he paid 45 euros in order to buy a tent for his family. They also host a family of 4, who have no money to buy a tent of their own. Others complain about the slow procedures concerning their asylum applications or health issues. “We only wait, waiting, waiting and waiting. Why is that? My baby boy is sick and we need to get to a big hospital,” said 29-year-old Mahmod Akla from Iraq. “Every month, approximately 200 refugees and migrants are transported from Chios to Athens. However, many more arrive from Turkey (on a monthly basis). The camp is full and cannot take any more people, this is why refugees set up tents around it,” reports euronews’ Apostolos Staikos.